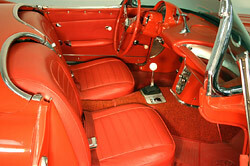 1959 CHEVROLET CORVETTE, GEORGEOUS RED ON RED CORVETTE ROADSTER WITH WHITE COVES, LUSH RED INTERIOR DASH SEATS AND CARPET LIKE NEW. 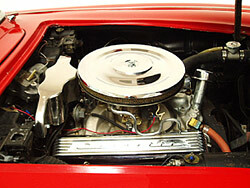 NEW WHITE CONVERTIBLE TOP, NICELY DETALED ENGINE COMPARTMENT. LOOKS VERY ORIGIONAL WITH A 327/270 H.P.,ENGINE, 4-SPEED MANUAL TRANSMISSION JUST REBUILT, BRAND NEW BIAS PLY WIDE WHITE WALL TIRES, AND NEW SPINNER HUBCAPS. NEW EXAUST. NEW WINDSHIELD, CAR LOOKS, RUNS AND DRIVES LIKE A NEW CAR. PLEASE CALL IF YOU HAVE QUESTIONS. 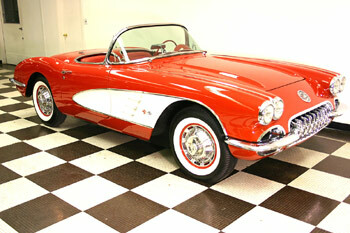 WE HAVE SEVERAL OTHERS CORVETTES AND CLASSIC CARS IN STOCK.